Visual management allows you to have tangible everyday conversations about the work in progress -- it makes work visible. It's such a simple concept and the return on investment is huge. It's a core principle of Lean. What's the ROI of visual management? We’ve blogged several times on the very high Cost of Delay. And most companies seem to accept the fact that being late to market with a commercial product will cost them a lot of money. But they are sometimes skeptical about whether or not Lean or Agile management software will really have a big impact on schedule. 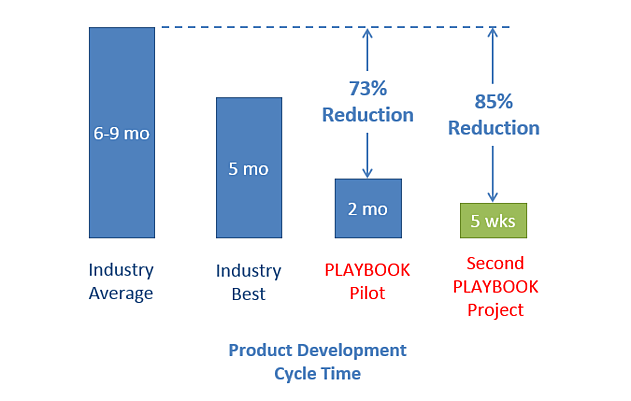 This concern most likely comes from the fact that a lot of companies have implemented a lot of solutions with the promise of reduced cycle times, and many of them have not delivered. However, I recently thought of a new way to show how Visual Management Software compares to other solutions and why it delivers such impressive results. One of the biggest changes to hit R&D for manufacturers was the switch from 2D wireframe CAD to 3D solid modeling. Once the benefit of these tools became known in the early 90’s the next fifteen years were a frenzy of adoption. I was an engineer at a company that made that switch and I documented a 4X increase in the number of parts the mechanical engineers designed per year. It was quite impressive! But it's clear to me that Lean and Visual Work Management will actually have a bigger economic benefit. 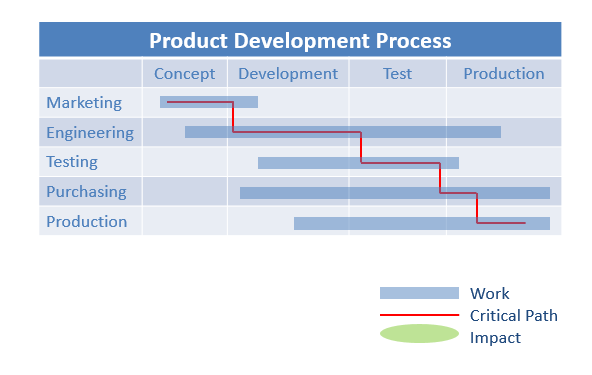 The image below is a highly simplified example of major project phases, various departments, when they’re active on a project, and when they’re on the critical path. So here’s an example of 3D CAD and how it might have made an impact on a very small portion of the critical path for Engineering. But Lean Visual Work Management is a different story. Because it’s used by the entire team for the duration of the project, its impact to the schedule is much, much greater than any point solution could ever be. 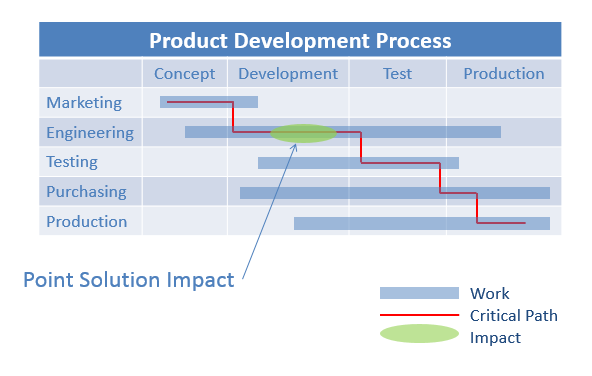 So the next time you’re trying to get a Lean or Agile Project Management initiative on your budget and need to prove its value, use the explanation above to show that it has the potential to make a bigger impact on the schedule than any point solution possibly can. Wanting to explore more about Visual project management software? Check out the on-demand video demonstration below that shows you two paradigm shifting concepts about why projects are late. Then watch part 2 to see how Playbook solves for these issues.